All of us aware that VMware is no more a hyper-visor company, as they entered into multiple business streams to expand their wings. VMware Cloud Foundation is another product works with SDDC, and brings the customer dream of deploying Hybrid cloud on supported hardware (vSAN ready). To respond to the ever-increasing demand for faster innovation, organizations are adapting technology trends and moving workloads to the public cloud. Although public cloud services can be a good fit for many applications, company-owned data center continues to play a critical role, with majority of the workloads live on-premises, especially those mission-critical applications that require greater control and security. As a result, organizations are looking to shift to a more agile, service-oriented IT model that leverages both private and public cloud. While customers recognise the need to complete the journey to the hybrid cloud, they are faced with significant roadblocks. 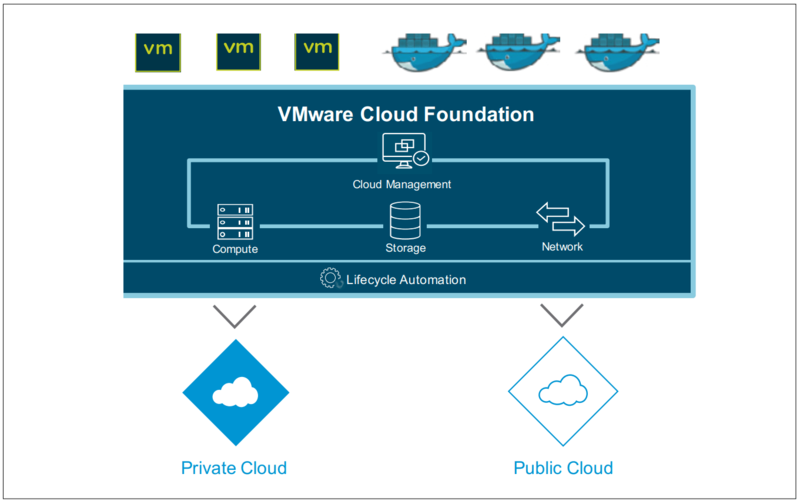 VMware Cloud Foundation is the unified SDDC platform that brings together VMware vSphere, vSAN, and NSX into a natively integrated stack to deliver enterprise-ready cloud infrastructure for the private. With Cloud Foundation, customers have a solution to run a fully virtualized infrastructure. Cloud administrators have the ability to expand and contract the underlying infrastructure to meet their changing business needs. With a cloud that is based on the market-leading virtualization platform, lines of business have the flexibility to deploy a wide variety of operating systems and application stacks within the tenant VMs. By integrating cloud management services, customers can automate the infrastructure and application delivery with self-service capabilities and day 2 operational capabilities across private and public cloud. Cloud Foundation provides performance management, capacity optimization, and real-time log analytics and IT automation to accelerate the delivery and ongoing management of personalised, business-relevant infrastructure, application and custom services, while improving overall IT efficiency. Policy-based governance and logical application modeling assures that infrastructure services are delivered at the right size and service level for the task. Cloud Foundation is the only solution in the market that gives customers the flexibility to run the same platform on premises and as a service through a public cloud provider. Organizations can build a true hybrid cloud with common infrastructure and consistent operational model, connecting on- and off-premises data centers to make them compatible, stretched and distributed. Cloud Foundation simplifies the design and implementation of a VDI environment based on VMware Horizon®, making VDI deployments faster and more secure. Private cloud administrators can focus on specifying the policies and needs of the VDI infrastructure instead of dealing with the details of deploying it. Cloud Foundation takes as input the logical capacity, service level agreements, and policy needs of target virtual desktops and automates provisioning of fully installed and configured Horizon VDI.